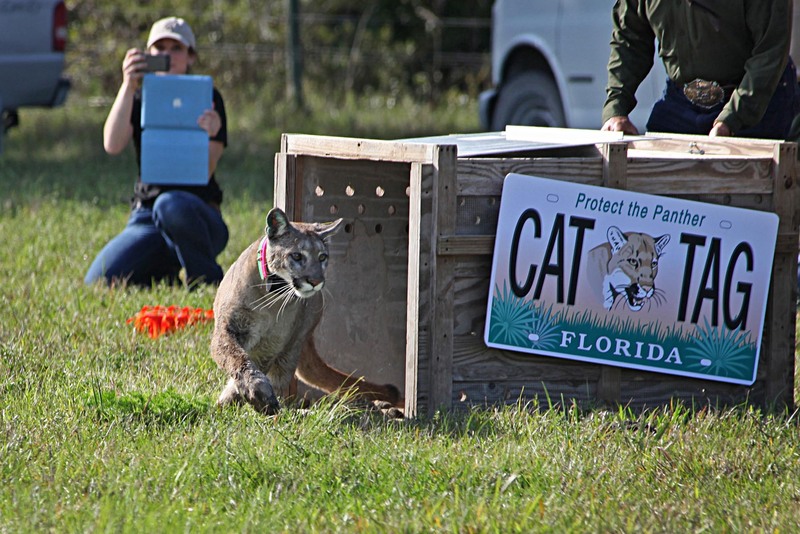 HENDRY COUNTY — The young panther was hesitant to leave the familiarity of her crate for the unknown wilderness of Big Cypress after a long day of travel from north Florida to the Everglades March 10. After a minute, the rehabilitated cat realized freedom was hers; she slowly emerged and took off running toward a cypress pond in the distance. She was gone in a flash, nearly a year after sustaining multiple injuries likely from a car collision. Last May, a homeowner noticed the then-9-month-old kitten hiding in bushes, injured, and alerted the Florida Fish and Wildlife Conservation Commission (FWC). The FWC brought her to the Animal Specialty Hospital of Florida in Naples where she underwent surgery on her fractured leg, fractured ribs and bruised lung. The panther was then taken to the White Oak Conservation Center in Yulee, Fla., where she was nursed back to health in a 10-acre natural enclosure with minimal human contact. 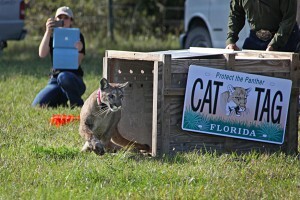 The healthy cat was released back into the wild by the FWC near the Big Cypress Reservation in front of a crowd of well-wishers who included FWC Commissioner Ron Bergeron, Florida Attorney General Pam Bondi and musician John Anderson. The panther was set free on Bergeron’s 750-acre Green Glades West Ranch, which borders the Big Cypress Reservation. Because female panthers require about 50 square miles for a home range in which to hunt, live and raise kittens, the panther will likely cross the boundary into the reservation. The collar will allow the FWC to track the 90-pound panther’s movements throughout her life, which could be 7 to 10 years or more. The Florida panther has been an endangered species since 1967. The Department of Interior’s Endangered Species Act defines an endangered species as one in danger of extinction throughout all or a significant portion of its range. The goal is to restore all federally listed endangered species to viable self-sustaining populations. Since the 1980s, the effort to protect and increase the Florida panther population has proven successful, but its habitat has decreased dramatically. Historically, panthers lived in the southeastern U.S. from Arkansas to Florida. 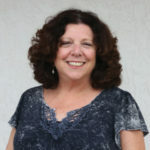 Today their range is limited to about 4,000 square miles south of the Caloosahatchee River and inland from the coasts. This range includes portions of Big Cypress and Immokalee Reservations, as well as the parcel of land on the northern border of Big Cypress that Florida Power & Light hopes to develop into a massive power plant. The FWC wrote a panther recovery plan in 1981 with the objective of preventing extinction. Bergeron said about 30 panthers lived in the wild in the 1980s, but today that figure is estimated to be between 100 and 160. The release of the panther was a moving experience for those who witnessed it. Anderson stood near the crate and sang “Seminole Wind” as the panther was introduced back into her natural habitat.